International Education News l The PIE News l US market share 2000-2009: why the decline? You are here: Home » Analysis » US market share 2000-2009: why the decline? US market share 2000-2009: why the decline? Posted in Analysis, under North America. Looking back over the last decade, with the 9/11 attacks, globalisation and the financial crisis all affecting student migration to the US over the last decade, few in international education will be surprised by the Organisation for Economic Co-operation and Development (OECD’s)’s recent revelation that the country’s share of the international student market dropped between 2000-2009 (despite reports that the market is bouncing back now). Despite welcoming by far the largest number of international students of any country annually, the US went from educating 23 per cent of the market to 18 per cent over this timeframe; the most significant change in performance of any of the leading exporters of international education in that period. Seen another way, it now caters to roughly a fifth of the market as opposed to a quarter. Others saw their shares decline but less dramatically so, with Germany falling two percentage points and the UK one per cent. Meanwhile the shares of students who chose Australia and New Zealand grew by almost two per cent in the same period. The findings are part of the Education at a Glance 2011 report, which compares the education systems of OECD member and non-member countries, and uses data on international students obtained from enrolments in their countries of destination. 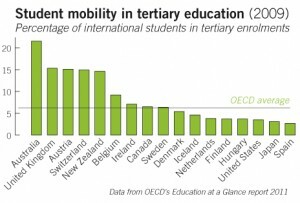 While the report has already begun to date – Australia has seen a slower performance in the last few years, for example – it does a good job of exposing long-term trends in student migration, most notably the significant realignment the market has undergone in the last decade. Between 2000 and 2009, the total number of international students ballooned 77 per cent to 3.7 million, driven by global demand for higher education, cheaper transportation costs and the increased internationalisation of universities. This led to a proliferation of study destinations and added competition for leading players such as the US. Different emphases in internationalisation policies, the costs of tuition and the growth of English language education in non-native speaking countries also explains why some countries have performed better than others, according to the report. Dr William Lawton, Director of the Observatory on Borderless Higher Education, agrees. “There are new currents in geopolitics and HE is not immune. Governments care but it has little to do with how individual universities develop their strategies, other than to take advantage of the fact that there are many more opportunities for international partnerships than before. For individual universities that is a good thing, not a threat,” he says. It’s not just diversification of destinations, but also of the education on offer that has fuelled competition. Many more countries, such as Norway and Germany, now teach university courses in English, which is seen as essential by international students hoping to enter the global job market. A number of countries have also offered lower fees than the top providers, and sometimes no fees at all in parts of Europe, though this is changing. “Continual price increases on the part of US institutions certainly makes growing the total numbers a challenge,” says Dave Anderson, Senior Director, Recruitment and Partner Support for ELS, one of the largest recruiters of international students for US colleges and universities.